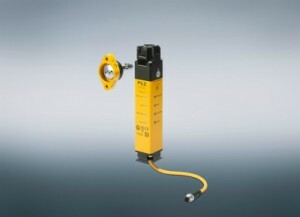 Pilz has added the new PSENmlock to its range of safety gate systems. The PSENmlock offers safety gate monitoring and safe guard locking for the protection of personnel and processes to the highest category PL e in one device. The slimline yet robust design and the many different installation options make PSENmlock both flexible to use and easy to install. PSENmlock is a reliable door guard for small and light , as well as, large and heavy doors and gates, and whether swing and sliding gates or covers and flaps. No matter the application, the flexibly mounted actuator ensures high tolerance compensation and unrestricted functionality even with sagging gates. Thanks to a bistable magnet, the currentless guard locking system reduces the energy consumption of the safety gate system. Diagnostic data is easily identifiable in many installation positions: LEDs on three sides of the housing support user-friendly diagnostics whatever the installation situation. With a holding force of 7500 N and the integrated latching force of 30 N, the safety gate system prevents the guard from opening inadvertently. This makes PSENmlock particularly suitable for machines with a hazardous overrun that makes guard locking up to PL d or PL e absolutely essential, such as rotating knives, flywheels or robots. In addition, an integrated mechanical restart interlock prevents the guard locking system from being activated inadvertently, without the need for separate accessories. Not only does the restart interlock make operating the machine safer, it also prevents an inadvertent restart during maintenance operations. In machines with an overrun, the greatest risk to the safety of the operator comes if the safety device opens inadvertently or too early. This makes it particularly important to avoid the hazardous situation when disabling a switch. The two-channel PSENmlock guard locking control ensures that opening the gate does not present any risk. Even fault scenarios such as short-circuits are detected safely, allowing any unintended opening of the gate to be prevented. PSENmlock offers safe guard locking and guard interlocking in one product. Pilz is an innovative automation technology company operating internationally. Pilz uses its solutions to create safety for man, machine and the environment. In addition to the head office in Ostfildern near Stuttgart, Germany, the family business is represented with over 2,000 employees in 32 subsidiaries and branches on all continents. Pilz solutions can be used in all areas of mechanical engineering, including the packaging and automotive industry, plus the railway technology, press and wind energy sector. These solutions ensure that baggage handling systems run safely at airports and roller coasters travel safely; they also guarantee fire protection and energy supply in buildings. Pilz also provides a comprehensive range of services worldwide, including safety advice, engineering, product training and seminars on the subject of machinery safety. For more information, please visit www.pilz.us.